The middle of the world, latitud 0 0′ 0” : Early in the morning and right after breakfast, you and our local guide would start the travel tour at the downtown area, well known as Quito Colonial. You would start your journey along the “churches´ trail” by visiting first the cathedral. In the cathedral, you will learn of its history and the guide would explain the internal design of the cathedral such as the “mudejar´s influence on its first stage, the area with 3 longitudinal wings, and a small transversal wing behind the choir. After finishing the round in the cathedral, we would take a brief walk to the church La Compania along with the guide’s expertise. The guide will enlighten you with history and fun facts from every place, in this case La Compania. Its decoration is based on muslin features and the altars are covered by gold leaf along with faces and birds carved. It is considered as an architectonic jewel in the American baroque style. It also has a religious value, because the rest of Saint Marianita of Jesus is located there, and according to some, she was the protector of the city. Afterwards, we will visit San Francisco, which is famous for the Cantuña story. San Francisco is well known due to its legends and stories, which make it culturally wealthy. At the San Francisco church, there is a local hand craft store called Tianguez, where you can find a variety of items from the Ecuadorian culture. Here, you can buy postcards, books, Ecuadorian music, natural products, and even get a coffee with Humitas (which is sweet corn tamale) offer at the local Café Cantuña located at the Plaza San Francisco. Around midday, you would go to “Mitad del Mundo”, a monument at the equator line that passes through our country. You may choose to either visit the Ethnographic or the Inti Ñan Museums, both located near the monument. Along the way, we will stop for a traditional Ecuadorian lunch (optional and not included). After the tour, you will return to your hotel. Early morning 8:00 a.m., our trip begins by driving through Cayambe and stopping at Quitsato Middle of the World. This cultural-tourist place is located at La Mitad Del Mundo, 47 km at North of Quito. It was built in 2006 and inaugurated in 2007 as an independent, non-profit project in a 24756 ft² (2300 m²) area. Its main goal is to share crucial aspects of the astronomical knowledge of the prehispanic cultures of the region. The expositions are carried out by community members as a self-sustaining project. After that, you will drive to Cotacachi Town where you will have time for an optional lunch “Not Included” before visiting the famous leather market of Cotacachi. Cotacachi is known as the “leather town” with good reason – it is the best place to buy great quality, cheap leather goods in Ecuador. Shopping for leather products in Ecuador couldn’t be easier in Cotacachi. We simply head to the main street, where all the leather shops are clustered for your convenience. The guide can help you to select good quality items and assist you in negotiating a fair price. After the tour in Cotacachi the guide will take you back to Otavalo to spend the night at the Hacienda Cusin. After breakfast, we will drive to Cotopaxi Volcano. On the way, we stopped to visit Otavalo, famous for its Indian market where you can admire some Ecuadorian crafts, after making a short tour of the market, will lead to some craft workshops dedicated to the manufacture of Andean instruments wind, as crawlers, panpipes, flutes, recorders, among others. They also make string instruments like charango, mandolins, and guitars. These products are sold in stores and during the fair in town. After both visits, you will have an optional lunch, before being transferred to Cotopaxi to spend the night. As you drive to Cotopaxi, the guide will take you to the hacienda, you will have an Optional Dinner. After breakfast, we will be ready for our trip to Cotopaxi National Park, which is located 59.54 km from Quito. Its lush endemic flora and fauna will allow us to see the representative species such as the Chuquiragua (also known as the flower of the mountaineer), wild horses, deers, llamas and more. While we are there, you can explore Limpiopungo lagoon, located near the volcano Rumiñahui (149.96 meters), or hike to observe birds. After Cotopaxi volcano and its surroundings, we return to the Cotopaxipungo hotel to enjoy a traditional lunch “Not Included”. After the tour we continue towards Papallacta, where you will enjoy a unique and beautiful landscape. In the afternoon we arrive at our destination. At Papallacta, you will enjoy the hot springs and a unique (optional) massage. You will have an Optional Dinner and spend the night. Early in the morning you will have a delicious breakfast and spend the rest of the morning at the Termas de Papallacta’s facilities before checking-out. Papallacta has some pools with different temperatures for use. Here you will have time to dive into the waters and enjoy “optional” spa treatments. After checking-out at the Papallacta resort you and the guide will go to have an optional lunch before heading to Hakuna Matata Lodge situated in Archidona, 15 minutes from Tena City. This private estate of approximately 150 ha is located just 10 km from Tena, the capital of the province of Napo. It is ideal for large-an inexhaustible series of activities that the area lends itself like no other place. Arriving at the Lodge you will be introduced to their rooms and can enjoy a welcome cocktail and dining. This is the day to enjoy the Amazon, there are some activities to do, it all depends on your preferences. It can be a walk in the jungle, visit the river or the waterfalls, see some birds, visit the communities or even go rafting in the Amazon rivers. In case you choose rafting, you have to let us know as it is not included in the package. After breakfast, we go to our next destination; Baths. On the way visit the Rescue Centre Wild Animals called “AmaZOOnico” which is just outside of Tena. Here we see animals in captivity and the whole rehab process. Upon reaching the town of Puyo, famous for its handicrafts made of balsa wood, parrots, macaws, and toucans. After the visit to the Amazoonico you will head off to Tena to have an “Optional Lunch” before continuing your wonderful holiday journey. Once in Tena, we will visit the Balsa House, here we can see the complicated manual process to create crafts of the locality. Depending on your preferences, you can visit the botanical park, Omaere, where you will learn about medicinal plants and also about the cultures of the Shuar and Achuar. Later, we will go to the city of Baños. You will be taken to the hotel to check-in, before going to explore the city of Baños in the night. After breakfast in Banos, we will start the tour to the waterfalls as this charming town is the refuge for more than 60 waterfalls, among the most visited you have: Inés María, Pailón Devil, Manto de la Novia, Hair of the Virgin, San Jorge, San Pedro, Chamana, Machay Agoyán, Phantom, El Placer, San Francisco, Cashaurco, Heart, etc. You can visit the waterfalls using different means of transport and also can meet them walking down the ecological and magical trails bridges and pendants. After the tours, the guide will take you for Lunch “Not Included” and transfer you to Riobamba to spend the night. After an early breakfast, the tour begins from Riobamba to the south. End-route we will make several stops, visiting the Balbanera Church, Colta Lake, and the indigenous town of Guamote (Note, Thursday is market day!). Mid-morning, we will arrive at Alausi where we will begin our adventure on Ecuador’s famous “Devil’s Nose” train. After an approximate four-hour ride, we will return to Alausi in the early afternoon. Our bus will be waiting to take us to Ingapirca, and tour members are more than welcome to pack a box lunch to enjoy along the journey. Continuing on, we will visit the Ingapirca fortress, located 3100m above sea level. These ancient ruins are the most important in the country. Their true history remains a mystery, as studies state they could have been a fortress, an observatory or a temple. After visiting the ruins, we will finish our trip in Cuenca by arriving in the early evening for an optional dinner and free evening. Attention: Depending on the days of the tour, you will have to make sure that you will be in Riobamba between Tuesdays and Sunday, for the devil´s nose train. Be aware that the train does not operate on Mondays. After a good breakfast, we start the tour heading to Gualaceo and Chordeleg. In the morning you will start the colonial city tour of the colonial Cuenca, the cultural capital of Ecuador and the center of art and craft. The cozy and nostalgic atmosphere is enhanced by the cobblestone sidewalks, flower-filled squares and noble facades with their ornate iron balconies. During this tour we see the manufacture of straw hats and visit small crafted guitar shops. Chordeleg is also visited, famous for its handicrafts in gold, silver filigree, wood, ceramics, etc. and finally, we will visit the main square and have time to shop. Immediately after breakfast, we head northwest towards Cajas National Park. After a short drive, we can take part in various activities such as hiking, fishing, bird watching, flora, fauna and more. We visit the Interpretation Centre located on Lake La Toreadora (the largest and most important in the entire complex). Here we see pictures and interpretations of the park. After the visit in the national park we will go towards Guayaquil, for you to spend the night. After breakfast our local guide will be waiting for you to start the Guayaquil City Tour. 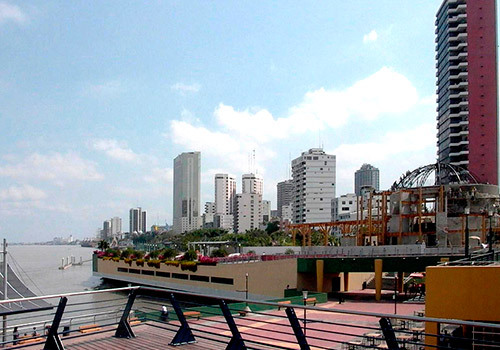 We would start the tour with the main tourist attractions from Guayaquil´s harbor, the main trade business part of the city, the Centennial Park, which has a monument in memory of the heroes of Guayaquil´s independence, Plaza de la Administration, the buildings of the city hall and the governance, the watch´s Morisca Towel, Sucre´s monument, and Bolivar´s Park where there is a statue of Simon Bolivar the main liberator of South America. This park is also known as the Iguanas´ park due to the presence of iguanas hanging from the green leaps of the trees. One side of the park is Neo-gothic. Then we will go to the Chrystal Palace, Plaza de la Integration, Plaza de las Banderas and Plaza Olmedo, which are next to each other on the south side of the city and through the marvelous Malecon 2000. Up north is Cerro Santa Ana, which has the oldest neighborhood in the city of Guayaquil called Las Peñas. It has been successfully renewed and built in wooden constructions painted on shiny colors, where some art galleries are operating for the public. The tour also includes the visit to the Malecon Del Salado. At the end of the Guayaquil tour, we will go to a restaurant located at the Malecon in order to Experience an unforgettable dinner along with some traditional music such as the Pasillos, which derive from the Vienna Waltz developed by Europeans in the Andean region of the Gran Colombia in the XVIII century- all this while you enjoy the view of the city during the evening. After you enjoy a wonderful breakfast, depending the time you will be taken to the Airport for your International connection.